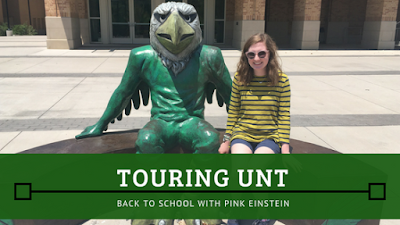 Last week my mom and I toured University of North Texas. It was a last minute decision to take a tour. My mom made me make a list of schools I wanted to tour and had thought about applying to and to be honest, I had a few too many dream schools on that list. I added UNT to the list because I knew a few people who had gone to school there and liked it but mostly to make my mom happy. University of North Texas is in Denton, Texas. Their colors are black, white, and green and their mascot is Scrappy the Eagle who you will see in a couple of pictures. With this being my first college tour I was so nervous but I enjoyed every minute of it! I can absolutely see myself going to school there. The day after the tour I started my application! What was the coolest thing about campus? Honestly, I loved everything about it! What drew you to the school? They had a fashion design program and it isn't as expensive as other schools I looked into with fashion design majors. Why did you decide to visit? To make my mom happy, I had no desire to go to school there. Tell us about the town. It has a small town feel and everything is centered around the court house. There are cute little dessert places like an old fashioned candy store and ice cream shop. There are also some fun and unique places to eat such as Barley and Board. The Square also has some cute boutiques and one that I really loved was Palm Tree Boutique. All of the shops and restaurants are within walking distance of each other and are a short drive from campus. We ate lunch at Barley and Board and loved it! What did you like about the town? It feels like such a small town and I love it! If you can see the old court house you know you are nearing The Square and all around the courthouse are the cutest shops! It reminds me of the town near my mom's house where my friends and I do all of our shopping and photo shoots but its so much cuter! What didn't you like about the town? There wasn't a single thing about the town itself I didn't like besides the fact that it is farther from home than I would like. What did you like about the campus? Everyone I talked to was so nice and extremely helpful! This may seem like a minor detail but they have single dorm rooms which is a big deal to an introvert like me, I need my own space! What didn't you like about the campus? How far it is from home. I was hoping that I could live at home while in college but with UNT being so far I couldn't do that. I got a picture with Scrappy the Eagle and practically burnt my arm in the process because he is metal and it was 100 degrees out! What's something that was unexpected? The rec center has an indoor lazy river. Yes, it is small but it is still a lazy river. Oh, and we can't forget about the 45 foot rock climbing wall that is also in the rec center. How far is it from Dallas? It takes anywhere from 45 minutes to an hour and a half to get there from my house but on the day of our tour it was raining and there were wrecks everywhere so it took us about an hour and 45 minutes. I thought this picture was funny. We were losing our group so I started to run off to catch up with them when my mom took the picture! 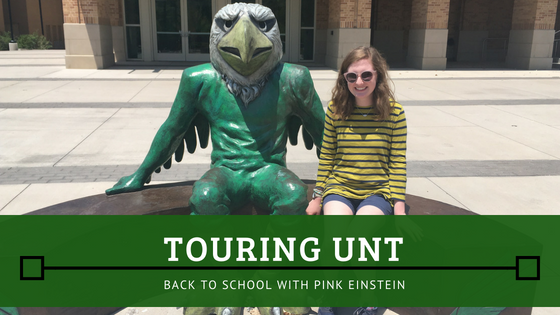 Overall, I LOVED my visit at UNT! The campus is gorgeous and I could 100% see myself going to school there! I also wanted to say thank you to Kaci from Princess In The Mirror blog for all of the food and shopping recommendations!